Dream Time Retreat is absolutely spectacular! This cabin was completely inspired by one single romantic verse: “They will live happily ever after.” As you enter Dream Time Retreat, you will be amazed at the detail in this cabin. The open floor plan is tranquil, inviting & lovely. 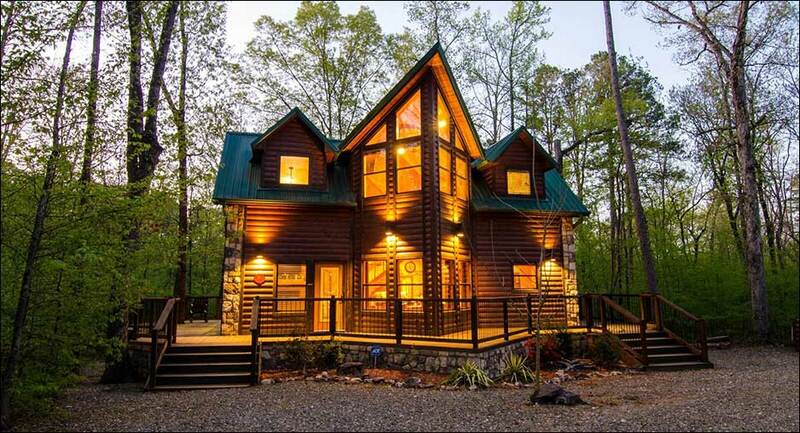 For a couples’ retreat, this cabin is positively perfect! This two story, one bedroom cabin will constantly surprise you with all the thoughtful extras you'll find throughout the cabin. As you step into the cabin you'll notice how open and light it is, with a wall of windows to your left and a beautiful open kitchen area to your right. The first floor of this cabin features an abundance of amenities like the large TV above the rock fireplace, the pool table and sitting area, and the gorgeous granite counter tops and stainless steel appliances in the kitchen. The secret of this cabin is the honeymoon suite located upstairs. The honeymoon suite is an amazing open loft featuring a double vanity countertop, a spacious walk in tile shower with glass front, an electric rock fireplace, and a decadent sweetheart jacuzzi tub offering views of the night sky. Step out onto the balcony located off the back of the second floor and you'll find a perfect, romantic covered deck complete with a large round hot tub, electric year 'round fireplace and TV. Just right for a romantic evening! The stairs lead down to the first level wrap around deck that features outdoor seating and a gas grill. Venture down to the ground level and roast some marshmallows at the stone fire pit. You'll find everything you desire and more at Dream Time Retreat! Will you marry me? Will you be my wife? Will you be my last girlfriend, ever? ... Come live in my heart, and pay no rent. Marry Me! Dream Time Retreat is a spectacular two story cabin with an unforgettable honeymoon suite. King Bed located in the honeymoon suite upstairs. This area features a double vanity counter top, spacious walk in tile shower, electric rock fireplace, sweetheart Jacuzzi tub, and a TV with DirectTV access. A twin bed is located downstairs in an under-stair nook and has a pull out trundle bed located underneath it. There is a half bath located downstairs as well. 3 Bed Types, Sleeps up to 4 people comfortably - Maximum occupancy is 4 people. Dream Time Retreat is truly a dream come true. This cabin will make your stay in the woods feel like you're living in the lap of luxury with the exceptional decor and thoughtful design touches throughout the cabin. The downstairs area features a flat screen TV, gas log fireplace, a pool table, a napping nook, and a designer kitchen. A second flat screen TV is located upstairs in the magnificent honeymoon suite. Outside you'll find a downstairs and upstairs deck, hot tub, gas grill, patio seating, and a fire pit. Dreamtime is located north of the lake in an area with other cabins known as Northern Hills. (Please click to view map) This cabin is semi- secluded. Dreamtime has privacy as the cabins are well spaced. All the cabins in this area are couple cabins. There are several trees in this area. The road to Dreamtime is a dirt/gravel road and very narrow. Dream Time has a circle driveway. Boat and Trailer parking is available and accessible for boats and trailers of all sizes. It is also accessible to motorcycles. Located approximately one mile west off of Hwy 259 – you will not hear highway noise from this cabin.